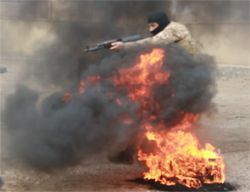 ISIS published video today of its training camp, Abu Hamza Al Muhajir, in Fallujah. In addition to running through fire, the recruits do somersaults while holding a large rifle, ending up in perfect position to fire. This is an Abu Wahib move. The child recruits trained in Raqqa also perform the somersault maneuver. I don't link to ISIS videos, so please don't put links in comments. But I am curious as to news about Abu Wabib, I haven't seen any in a while. Abu Wahib: Dead or Alive? 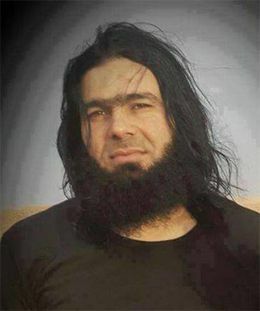 Abu Wahib, as I've written before, is the most recognizable, telegenic and frightening looking ISIS fighter. He is the military commander for the Anbar province in Iraq. He has falsely been declared dead several times, including within the past year. Yesterday, there were reports by pro-Kurdish tweeters saying he had been killed in Kobane. Others said he was killed in Ramadi.